You have your resume sparkling, your coffee is hot, your internet job searching skills are in action…but wait! You may be about to commit one of these 3 mistakes people innocently make when applying to a job ad. 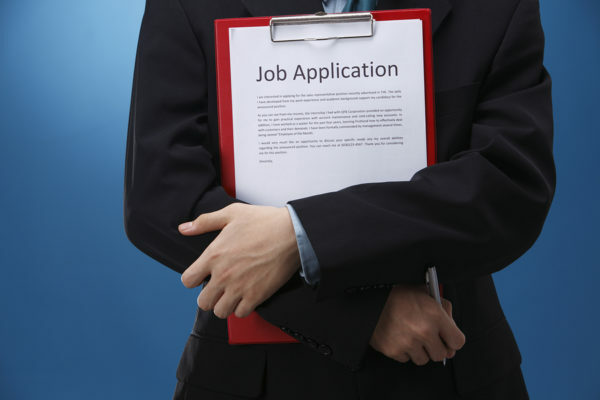 Make sure you do not fall victim to these easily preventable job searching set backs. There is nothing worse to hiring managers than responding to an applicant with an interview, and then a job offer, only to be told that the candidate is not ready to take the position. Anything other than a standard two weeks notice to a current employer is unacceptable when hoping to be hired for a new job. This means that applying to positions that require you to move or go out of town to receive training, and not having a solid plan in place to relocate or be absent from home, will only leave your potential employer frustrated and you possibly out of a job again. One of the first things that modern-day hiring managers do when they are considering responding to an application is check out the candidate’s profiles on social media and perform an internet search. Before you send in that first application, make sure there is nothing that could be seen as inappropriate on your Facebook, Instagram, and other online profiles. There are certain security measures you can take to prevent your friends from “posting on your wall”, which will keep you in control of your reputation in the online world. So you get that anticipated response to your application! You then go in for an interview, and it goes great! After waiting for that final call back you decide to learn more about the company you are about to get hired for. You discover that they have a terrible reputation for how they treat their employees. You are now caught in a situation where you have to decide to follow through with the job you have before you (not to mention you have stopped “job searching” while you were interviewing with the company) or go with what your research has turned up and turn down any further talks. It is a completely preventable problem that only takes a quick internet search before hitting send on that resume. Landing your next dream job is a process that involves many elements. The process all starts when you submit your resume to a job advertisement. Make sure you get off on the right foot by avoiding the above 3 mistakes. Happy job hunting! One of the most important factors in landing the job of your dreams is confidence in yourself. Unfortunately, nothing depletes your confidence faster than the monotony and rejection that can sometimes come from the job search. There will be days when all your efforts are fruitless and you feel like giving up. Don’t let this common pitfall slow your progress on finding the job you know you deserve. Below are 3 ways to keep your confidence soaring when searching for a job! Self-help books can be very valuable while searching for a job. These books have strategies for defining and attaining your biggest goals. After a day of scanning job ads and giving interviews, ending the day with some positive and grounding reading can do wonders for keeping your eye on the prize. Books such as “The Success Principles” by Jack Canfield and “How Successful People Think” by John C. Maxwell are great reads to pick up to help you remember the bigger picture when things seem to not be going your way. Sometimes the last thing we want to do when we are stressed from a day of job searching is think about hitting the gym. Make it a point to start your day with a 30 minute cardio session and you will benefit from mood-boosting endorphins that are released when you get your heart pumping. Set yourself up for success physically and you will thank yourself in the long run. Knowledgeable people are among the most confident people in the world. Make sure that you are learning about what your industry’s trends and hot topics are while you are searching for employment. Do you work in the apartment industry? Read the National Apartment Association’s industry blog and other related websites and magazines. Not only will you have great things to talk about in interviews, but you will be improving yourself professionally too while you are searching for your next great career opportunity. Job searching takes time and effort. Don’t let the process get you down, the job you deserve is out there waiting for you! 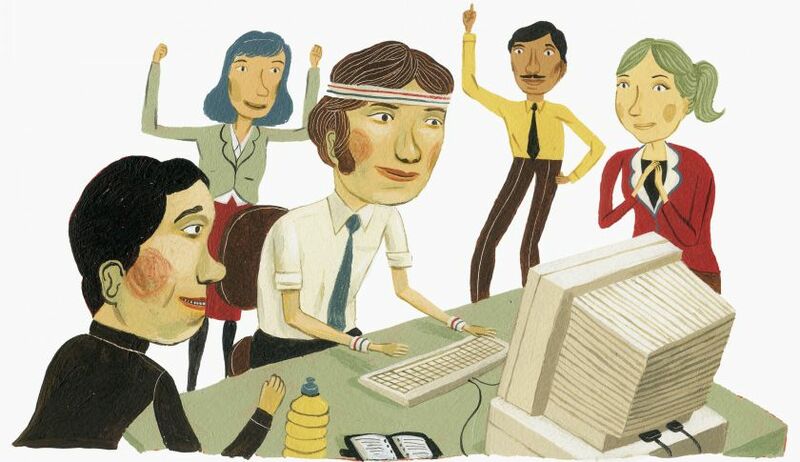 Most people will agree that starting a job search can be a job within itself. Just like any other endeavor, there are ways to make your job search much more effective and continuously rewarding. Don’t let yourself get “tricked” by common mistakes, instead set yourself up to win your dream job along with the many “treats” left over from getting yourself ready to land a new position with a top company. 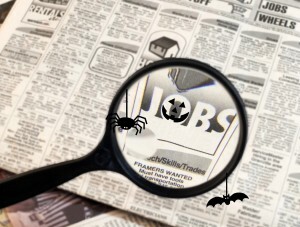 Below we will walk you through some of the “tricks” and “treats” of the job search. Trick: Write a Resume Geared to Each Job You are Applying For. A resume is often considered as step one of searching for a job. While it is true that many companies are moving towards social media as a way to learn about a candidate, resumes are still often used as the initial impression to a hiring manager. One of the biggest mistakes job searchers can make is to use a general resume for jobs that are asking for specific things. Instead, why not craft a new resume for each job you apply for? This ensures you use the language of the job description and that the experiences and accomplishments you list align with the opportunity. You can make sure you have done this properly by pasting your resume into a word-cloud app, like TagCrowd. The app will generate a cloud of the top used words in your resume. The more frequently you use certain words, the bigger they are in the cloud. This way you can literally see what your resume looks like in a glance, which is how the hiring manager will see it when it first comes across their desk. Treat: Start Networking Through Giving. 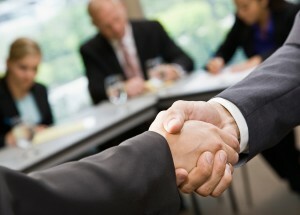 Networking can be very intimidating, especially when you are in the market for a new job. Many job seekers worry that networking is one-sided and people in their network will know that they need something from them. That is why it is essential that you stop treating networking as a means to get what you want and focus more on what you can do for your network. Soon you will establish credibility and trust, create opportunities to turn chance encounters into long-term one-on-one relationships, and put yourself on equal footing with potential employers or referrers. Figure out your skill by looking at what attracts you to the job positions you apply to? Re-read the last 3-5 jobs you applied to that you really wanted. What are the specific skills that you have that matched their wants? What problems are these skills needed to solve? Think about how you can package these unique skills into an offer at a networking event or informational interview. When the niche skill is well matched to a networking contact’s needs, it gives job seekers a natural way to transform a one-time encounter into a long-term relationship. Plus, skills-based networking shows instead of tells your value to an individual or company, which could lead to job opportunities or referrals for years to come. Trick: Find a Way to Connect with the Hiring Manager. A personalized cover letter is a fantastic opportunity to make you stand out from your competitors. However, you need a edge to really catch the attention of the person scanning resumes. Social media makes it possible today to research not only the company you are applying to, but the person that will be interviewing you at that company. You may have graduated from the same college or belong to the same professional association. Or, see if he or she has been cited in a news article so you can mention it in your cover letter or at your interview. If the recruiter’s name is cited in a job ad, use LinkedIn.com to determine how you might be connected to them. Other sites useful for uncovering connections include Ryze.com, ZoomInfo.com and Google. Bear in mind that you might not always be successful, but it won’t hurt to check. This “trick” could be the thing that lands you the job! Treat: Subscribe to Job Alerts and RSS Feeds. On most job boards, you can register to receive emails alerting you to new postings that meet your criteria, such as location or keyword. Searching for a job in San Antonio in the apartment industry? You can easily set up alerts that match your desired jobs to see what’s out there. Most also allow you to select their frequency, such as daily or weekly. Even if you are happily employed, you will always know what opportunities are out there so you can be sure you are right where you want to be. Learning how to job search does not have to be scary. Avoid the tricks, set yourself up for the treats, and enjoy the adventure of finding your perfect career home! For more information on finding your perfect job CLICK HERE! Three years ago Herman was job hunting with no success. He was looking online and applying to jobs but had an impossible time finding work. When an ad popped up in a Google search offering $10-12 per hour for Groundskeeping work, Herman hopefully applied and ended up in the Hire Priority office the next day for an interview. Herman’s job search was finally at an end—the very next day after he came into the Hire Priority office he was out working at a property as a Porter. What began as temping for different apartment properties in Austin turned into greater and greater opportunities to move up the apartment job ladder for Herman. From Porter work, Herman quickly accelerated his career, becoming a Make Ready and now Assistant Maintenance supervisor. “Hire Priority changed my whole life,” Herman says. “I don’t know what I would have done without them.” Over the course of three years Herman worked various temp and long-term positions around Austin, each time coming to Hire Priority for a job placement. Today, Herman’s job search days are long gone and he has a job that he enjoys and feels challenged by every day. In the future, Herman sees himself opening up his own HVAC company, a dream that his maintenance career has prepared him well for.